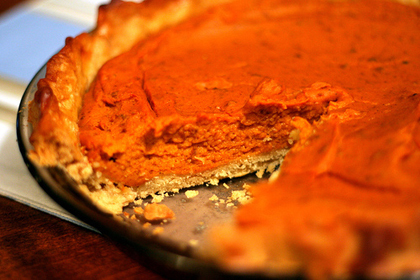 I didn’t think you could make a sweet potato pie any better until I came up with this recipe. It is perfect and adds an entirely new dimension to the flavor. The coconut gives a fruity and rich flavor to the potatoes. ½ cup of toasted unsweetened Coconut. If you use sweetened coconut, then cut back one Tbsp of sugar. Peel the sweet potatoes and cut into 2 inch pieces and boil until done. You will know they are done when you stick the pieces with a knife and they slide off. After the potatoes are cooked, drain them and transfer them to a large bowl and blend well with the butter using a mixer. Toast the coconut in a 350 degree oven until golden brown. Add the remaining ingredients except the eggs and allow the mixture to cool. When sufficiently cool, add the eggs and blend well and pour into a 9-inch deep-dish piecrust and bake at 350 degrees for 45 to 55 minutes.